Here’s a video clip from April of 1986 when Parousia’s music video “Keep Running” was broadcast on TV and although it was a UHF station only, it was still a big deal back in 1986. This was the first airing of our music-video on television (not withstanding the MTV basement tapes debacle). The locally produced TV segment was called “Shooting Stars” which focused exclusively on Western New York talent. The host of the show was local musician and producer Don Tomasulo. Don performed in his own rock band called “Benhatzel”. 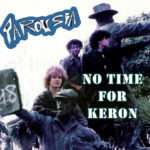 When Don introduced “Keep Running“, he said that Parousia was one of the “hardest working groups I’ve come across in ages”. That was flattering to hear from someone that didn’t routinely work with our entourage and didn’t owe us anything. Don’t look for your little world you try your best to make it end. You got to Keep Running. First, not many bands in the area had a professional video on a Sony U-matic, ¾ inch video tape. Especially a concept video as complex as ours. It had a lot of ‘production value’ that is to say, it wasn’t just footage of our band performing on a sound stage, playing our instruments, lip-syncing to a pre-recorded soundtrack. Our video was one of the first music videos in Buffalo to have a story-line shot in multiple locations (New York and Texas). It had computer graphics, stop-animation and… oh yeah, something absolutely no one else had… an appearance from Buffalo’s Ms. Heavy Metal, Nicole Ashley! It took a lot of ‘people-power’ and elbow grease to complete the principal photography in Buffalo NY and then haul our asses out to Texas to finish the rest. It put all of our management and networking skills to the test but somehow, we pulled it off. With very little money and the right connections, we pulled it all together to make it happen. The entire budget of ‘Keep Running’ was under $1000 and that included the trip to and from Buffalo, NY to Dallas, Texas. The fact that this video exists at all is largely because of the hard work put into this project by the Filippone brothers, Randy and Gregg. 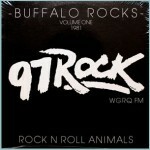 Randy Filippone ran his audio and video studio on the West Side of Buffalo. He recorded all of our live action shots in Buffalo using mobile and tripod mounted cameras. He took wide shots of the entire band playing on stage from multiple angles and then multiple close-ups of each member individually. We had a lot of fun re-decorating the Chamber with Bob’s art to suit the occasion. I filmed the Bob Lowden stop-animation sequence on a super-8 camera, deep in the bowels of one of the many back rooms behind the stage. That was a blast. It took hours to move the art pieces an inch at a time to create the right flow. Then, I used a strobe light, black light, glow paint, Styrofoam chunks and a window fan to get the other effects. The outdoor/indoor location shots and video editing were done by Gregg Filippone, our former sound man living in Texas, managing a college AV department. He had access to professional VHS cameras, a video editing bay and plenty of students who were willing to be part of the road crew (for free). In 1986, we filmed our video using a top-of-the-line JVC VHS video recorder. They were large and bulky delicate cameras, crazy expensive and a lot of work to maintain. The second wind in our favor was that many people were still watching free Television… you know, VHF, UHF…with a set of rabbit ears on top of a TV set? Cable Television had just started to catch on but was growing slowly in Western NY because of the monthly cost. And so we knew that a large part of our audience could easily access our video on UHF assuming your antenna was able to tune us in. So this was it; Parousia’s music video televison premiere! Although MTV had cancelled our appearance a year earlier, we were finally being broadcast across the magic that is TV for all of our friends and family to see and hear (fear?). It wasn’t exactly Ed Sullivan but hey, for us it was still a really big show.